The winning class with their instructor, Jane Stafford. 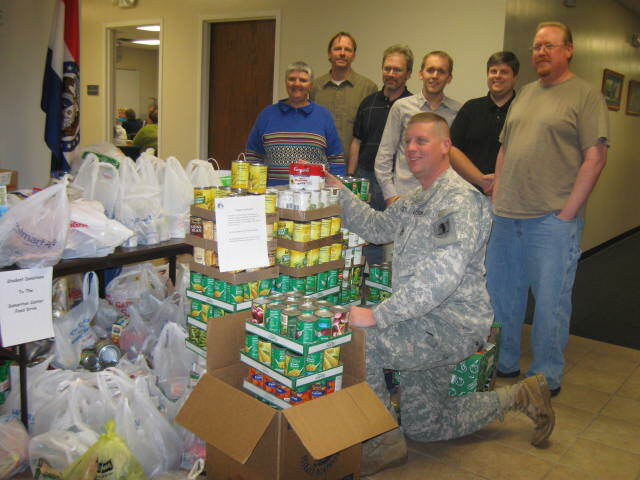 In December, Columbia College–Jefferson City held a food drive supporting the Samaritan Center — a local charity. To drum up support, two challenges were arranged. First, a competition between the students and the faculty and staff was set up. As the students outnumber staff, the outcome of the students winning (by a landslide) was expected. The second competition was between each of the classes. A small class of six students won this challenge. As a thank you to all the participants, popcorn was served, and the winning class was awarded a special treat. Two barrels were delivered to the campus to be filled for the food drive. Little did everyone know those barrels wouldn’t be enough to hold one-tenth of the food donated! When the Samaritan Center staff came to collect donations, their truck was overflowing. The food drive not only supported a great charity, but it also sparked a sense of community within the Jefferson City campus.